The crown is decorated with about 2,800 diamonds, most notably the 105-carat (21.0 g) Koh-i-Noor in the middle of the front cross, which was acquired by the East India Company after the Anglo-Sikh Wars and presented to Queen Victoria in 1851, and a 17-carat (3.4 g) Turkish diamond given to her in 1856 by Abdülmecid I, sultan of the Ottoman Empire, as a gesture of thanks for British support in the Crimean War. The Koh-i-Noor became a part of the Crown Jewels when it was left to the Crown upon Victoria's death in 1901. 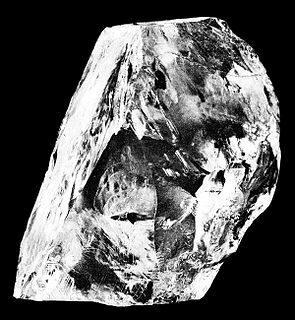 It had been successively mounted in the crowns of Queen Alexandra and Queen Mary before it was transferred to The Queen Mother's Crown. After the death of the king, Queen Elizabeth, known thereafter as the Queen Mother, did not wear the full crown, but wore it minus the arches as a circlet at the coronation of her daughter, Queen Elizabeth II, in 1953. It was placed on top of the Queen Mother's coffin for her lying-in-state and funeral in 2002. The crown is on public display along with the other Crown Jewels in the Jewel House at the Tower of London. ^ Kenneth J. Mears (1988). The Tower of London: 900 Years of English History. Phaidon. p. 152. ISBN 978-0-7148-2527-4. ^ Edge, Simon (30 July 2010). "The Crown Jewels: The Queen's cursed diamond". The Sunday Express. Retrieved 15 February 2015. ^ Leslie Field (1997). Queen's Jewels. Harry N. Abrams. ISBN 978-0-8109-8172-0. ^ Brian Barker (1979). The Symbols of Sovereignty. Rowman & Littlefield. p. 136. ISBN 978-0-8476-6192-3. ^ "Visiting the Crown Jewels". Historic Royal Palaces. Retrieved 13 January 2016. 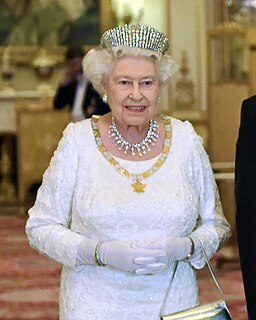 "Queen Elizabeth The Queen Mother's Crown". Royal Collection Trust. Inventory no. 31703.